Although the Health Insurance Portability and Accountability Act (HIPAA) was first passed into law by Congress in 1996, many are still contending with the massive scope of the legislation and the many organizations that have obligations under this law, even those who are not healthcare providers, hospitals, or health plans. HIPAA is the first federal law to address health privacy in a comprehensive way. HIPAA can be separated into three general areas: electronic transactions, privacy, and security. At this time, only the regulations related to the electronic transactions and privacy areas have been finalized. The HIPAA Privacy Rule covers all identifiable information or personal health information (PHI) about a patient that is transferred to or maintained by a healthcare provider, including e-mail, electronic, fax, paper, oral, and voice mail records, as well as phone conversations. HIPAA rules protect the information itself, not the record in which the information appears. In other words, information does not lose its protection simply because it is stored in or printed from a computer. Even at this late date, much confusion exists in all industries regarding compliance requirements, who must comply, and who need not worry about compliance. Most healthcare organizations must comply with HIPAA’s Privacy Rule by April 14, 2003, but many other organizations, including a large number of employers, also will be affected by this rule. In fact, HIPAA’s Privacy Rule will impact, at least indirectly, all organizations in some way. Learn more about HIPAA and about records management solutions that enable compliance by contacting Image Data for a Document Management Assessment. The passing of the USA PATRIOT Act reinforces the reality that any paper or electronic data management program should garner top priority for corporate leadership and corporate governance. The Patriot Act requires the Secretary of the Treasury to prescribe regulations “setting forth the minimum standards for financial institutions and their customers regarding the identity of the customer that shall apply in connection with the opening of an account at a financial institution.” Broker-dealers must develop and fully implement the customer identification program (CIP) by October 1, 2003. The CIP must include procedures for making and maintaining a record of all information obtained. Retention of records: The broker-dealer must retain the records made under paragraph (b)(3)(i)(A) for five years after the account is closed and the records made under paragraphs (b)(3)(i)(B), (C) and (D) for five years after the record is made. In all other respects, the records must be maintained pursuant to the provisions of 17 CFR 240.17a-4. Make electronic-data and paper-based document management a business initiative, supported by corporate leadership in the form of a corporate governance sub-committee. Maintain records of all types of hardware and software that are in use and the locations of all electronic data. Create an employee technology use program, including procedures for written communication protocols, data security, employee electronic data storage and employee termination/transfer. Clearly document your corporate data retention polices in a record procedures manual. Document all ways in which data can be transferred to or from the company. Regularly train employees on the company’s data-retention policies. Implement a litigation response team, comprised of outside counsel, compliance staff, corporate counsel, the human resources department, business line managers and IT staff, that can quickly update or amend document-destruction policies. Be aware of electronic “footprints” – delete does not always mean delete, and meta-data is a fertile source of information and evidence. Cease formal document destruction policies at the first notice of a regulatory investigation, suit or reasonable anticipation of suit. Note, the subject or topic of an investigation or suit may reside on any business records, data file or reference archive. Finally, make a practice of conducting routine audits of policies and procedures, compliance assessments and enforce violations. 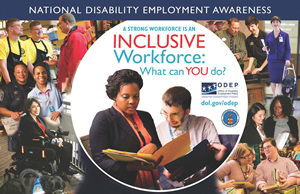 Image Data, Inc. was awarded Employer Recognition for the National Disability Employment Awareness Month as an employer with 25 to 99 employees. The cost and magnitude of regulatory mandates associated with corporate compliance, particularly records management, have increased significantly in recent years. As a result, many more companies, not just those in traditionally regulated environments such as pharmaceuticals and aerospace are finding that they need to change from a departmental plan or ad hoc approach to an enterprise-wide compliance strategy. Is your organization prepared to meet the regulatory requirements of the Department of Defense 5015.2 Standard, the Sarbanes-Oxley Act of 2002, or the Security and Exchange Commission’s Rule 17a? How will your company balance the cost of compliance with the risks of non-compliance? What are you doing to build investor confidence and trust – and can you do it without diluting shareholder value? And, last, but certainly not least, how much will it cost you to comply? To reduce risks as well as costs, companies are turning to enterprise content management (ECM) – of which enterprise records management (ERM) is a significant part. Because ECM provides a robust environment for managing all types of unstructured content (documents, Web pages, images, rich media, etc.) across the full lifecycle (creation, management, delivery, and archive), companies can solve not only their compliance challenges, but leverage this investment for on going competitive advantage and operational efficiency. Learn how your company can meet that challenge through an effective ERM strategy tightly integrated with ECM. Many organizations throughout American government and business have adopted Department of Defense (DoD) Directive 5015.2, issued in 1997, as a de facto records management standard. It provides detailed implementation and procedural guidance on the management of records in the DoD and its departments and offices. In 2002, Congress enacted the Sarbanes-Oxley (SOX) Act in response to Enron, Worldcom, and other accounting scandals. SOX affects all publicly traded companies, private companies that may go public or be acquired by a public company, and public accounting firms. Among other things, it makes it a federal crime to obstruct justice by destroying or tampering with corporate accounting records. Section 404 of SOX specifically outlines the requirements for public companies regarding records retention. Everything must be documented in a way that can be reviewed by auditors, including policies and procedures, approvals, authorizations, verifications, recommendations, and performance reviews, in addition to financial data. This includes the widely publicized mandate that CEOs and CFOs must personally certify all financial statements. In addition to responding to the Sarbanes-Oxley mandates, companies must comply with an expanded SEC Rule 17a and related regulations. SEC Rules 17a-3 and 17a-4 spell out new requirements for securities brokers, dealers, investment companies, financial advisers, and transfer agents regarding records of electronic interoffice communications and communications with customers. Other regulations relevant to records management include NASD Rules 2210, 3010, and 3110, NYSE Rules 342 and 440, ISO 15489, and MOREQ. Together, these rules impose strict ERM requirements on regulated organizations. In responding to these new regulations and the events that led to their adoption, executives face many challenges. They must manage compliance issues inside and outside the enterprise, balance the organizational costs of compliance with the risks of non-compliance, increase visibility and transparency for corporate practices, and take other steps to maintain or restore investor confidence. To learn how enterprise records management helps organizations meet the challenges of broad challenges of compliance, go here.